But for a film title, animator Henry Selick might be as much a household name as Tim Burton: Burton's name became part of the title of the stop-motion extravaganza The Nightmare Before Christmas, but Selick did all the heavy lifting, as the actual director. It was a natural project for a creator who'd tried just about every animation technique, from cel work at Disney to cutout techniques on the MTV pilot "Slow Bob In The Lower Dimensions" to stop-motion work on Ritz Bits and Pillsbury products. But Nightmare was a project of a different order—a fully stop-motion movie more notable for its gorgeously detailed design and animation than anything else. After Nightmare, Selick tried incorporating animated characters and sequences into live-action movies, but the results, Monkeybone and the Roald Dahl adaptation James And The Giant Peach, were troubled productions that debuted to mixed reception. 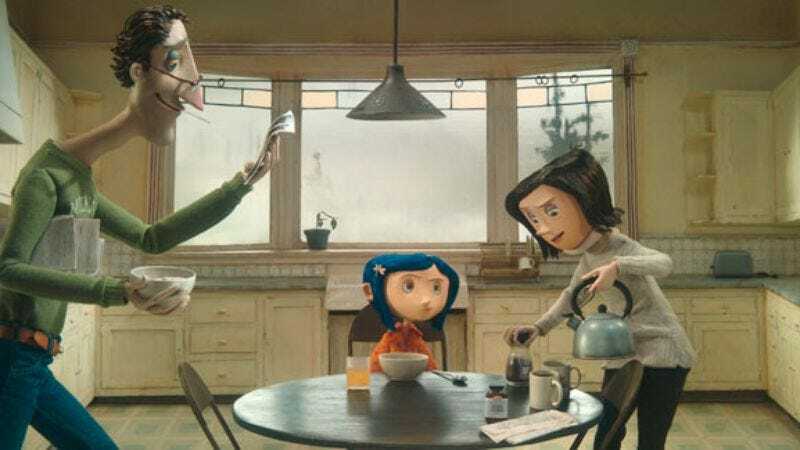 Eight years after his last feature, Selick has returned to form with another stop-motion feature, the strikingly lovely, impeccably crafted Coraline, an adaptation of a Neil Gaiman novel that comes with a good deal of Nightmare's blend of morbidity and perky wholesomeness. With the film finally ready for theaters after nearly four years of pre-production, planning, and shooting, Selick sat down with The A.V. Club to talk about his beloved craft, and to demonstrate it with one of the film's eight-inch, meticulously detailed Coraline puppets. The A.V. Club: Everybody asks this, but it seems like the only place to start a conversation with you. Why stop-motion in the CGI age? Henry Selick: You know, I love stop-motion. I've done almost all the styles of animation: I was a 2D animator. I've done cutout animation. I did a CG short a few years ago, "Moongirl," for young kids. Stop-motion is what I keep coming back to, because it has a primal nature. It can never be perfect. There's always something like—[Points to the Coraline puppet on the table.] Coraline's sweater, you can notice here that it's sort of boiling. And that's because people are touching it and moving it for every frame. There's an undeniable reality that I don't think any of the other mediums give you. You know these things are real even if you don't know exactly how they move, how big they are. It's something I got when I was 4 or 5, and I saw my first Ray Harryhausen film. I saw some monsters he created. So why still follow that in this day and age? Well, it has certainly been the age of CG, and the hits keep coming. You know, Jeffrey Katzenberg's company [DreamWorks], they seem to have a formula. Pixar as well. And they make very, very well-made films with maybe the best story department in the world. But I do think there's a part of everyone that likes to see handmade stuff. That's what we offer. It's never going to be the dominant filmmaking style. It's always going to be the cousin off to the side. You know, the more eccentric relative of yours that some of the kids like. CG can do anything, but it can't do everything well. What it naturally can do is special effects. But using stop-motion comes from our desire to do handmade stuff. There are always going to be kids who get out whatever it might be—clay, bits of wire, Barbie dolls, Legos. They want to tell little stories. Almost any modern video camera can take stills, so there's always this fresh crop of kids that like making things and moving them by hand. So it's as much our desire to keep it going as what we believe is the public's desire for handmade stuff that really feels handmade, where they aren't being tricked into it being handmade. That keeps us going. AVC: It's easy to mistake Coraline for CG animation, though, since the motion is so smooth and the backgrounds are so elaborate. I knew going in that you'd used a mixture of stop-motion and CGI, but watching it, I kept thinking "Did I understand this wrong? Is it mostly animated, with just a few stop-motion touches?" Is that a problem, if people don't realize they're looking at physical objects, and they don't get that sense of reality? HS: No. No, I love that you didn't know how it was made. I don't mind at all that you thought it might be CG. We think that you can still astonish people and surprise them with this approach. So that's good enough. If you're interested in researching the techniques we used before seeing it, fine. There's a website where you can see how it's done. You can see that there's hundreds of individual faces for the characters, with every possible expression. But it's not important. It's not necessary to know that, but if you're curious, it is a pretty interesting backstory. The world that makes these movies is pretty incredible. I work with several hundred artists and technicians. They're incredibly inspired people. Immensely talented and dedicated. AVC: And presumably very, very patient. HS: They're patient. But I don't have to be. I get rewarded virtually every day with something amazing to see—whether it's a new shot, a miniature sweater, someone who's figured out how to make the hair look really great. We found a way to do the rain, finally. And mud. Make the trees. So I get to stay in constant motion as a director, you know, reviewing things. And there's a lot to review. AVC: How do you screen for employees with the level of patience and perfectionism you need, people who are going to be able to spend two or three years handcrafting tiny little details? HS: You know, it goes back to my beginnings. In fact, one-third of our crew are people I've worked with for nearly 20 years. So those are the veterans that early, early on proved that this is what they also love. Even if they had to go into CG to make a living, or take on other tasks. So there's people like Eric Leighton, one of our lead animators, Trey Thomas, Anthony Scott—these are some of the best stop-motion animators in the world. Bo Henry, Tom Proost, Phil Brotherton, my art directors. There's a core group there that has its own history, so you can have some momentum going right away. And I think it pretty much attracts the right people. You look at portfolios, you look at student films. The material, the story, and the technique alone—I'd say 90 percent of the people interested in working on a film like this are the right people in temperament, and it's just a matter of skill level, and deciding where to put them. How advanced are they? AVC: Early on, when you first sold Coraline, you agreed to make it as a live-action film, just to get your foot in the door. How did you bring people around to letting you do it your way? HS: I took it to our producer, who remains one of our producers, Bill Mechanic—he had been the head of Fox, but he started this independent company. He got the material the same way that I did, via Neil Gaiman's book, which was great. He happened to have a distribution deal with Disney, and he was not allowed to produce animation, because that would be competing with Disney. So, it was like, "Okay, he can only do live-action, so we'll pretend it's live-action, and we'll see what happens." I feel like right from the start, I was into animation, and animators are, as you've noticed, very patient people. So I went along with the current reality of limitation. Eventually his deal changed, and I was able to steer it back to what I'd hoped to do in the first place. AVC: There's a shot in the end credits that shows the little paper cutouts of the jumping mice unfolding, supported by all these tiny wires and armatures. Is that actually the raw, untouched footage of how you accomplished that particular effect? AVC: So were the CG units credited in the film mostly involved in erasing the armatures and the little lines across the character's faces, where the two halves of the face shells meet? HS: Yes, most of the CG was used to enhance or clean up the stop-motion. There's only one purely CG-generated scene, and it's the background where the ghost children come into her dream to warn her. The backgrounds there are pure CG, and pretty obviously so. There's little bits of CG here and there. There's fog. There's this foggy day, and Wybie is kind of stalking Coraline, and then he gets the banana slugs. We shot the characters, and then we laid down a bunch of cotton and CG-manipulated that to make it look like it was flowing. It's more of a support rather than an original generation. AVC: In the film's making-of featurettes, there are a lot of stories about problem-solving in production design, like using fake fur for grass, or popcorn kernels for cherry blossoms. What visual solutions were you proudest of? HS: It'd be hard to pick any one thing, because there's hundreds of great solutions to various problems. One of the outstanding ones is the final confrontation with the Other Mother and Coraline, when the living-room floor flies up, and there's this giant metallic web, moving and bouncing like a big slinky. That was phenomenally difficult to engineer. We ended up making five versions of it, and we had a lot of work attaching things to it, mainly wire with little winders and things, to make it bounce. And then it was hard to find ways to give animators access to the characters inside. Something not quite as difficult but pretty amazing is the fantastic garden. Most all the flowers that grow there in front of Coraline—aside from some blue flowers, which were actually filmed as stop-motion, but CG was used to replicate them many times over—almost all the transformed flowers are little feats of engineering, things that were derived from toys, original mechanical devices, things that turn inside out, little spirals going through bits of plastic. That was a case where I said, "Let's design the flowers around what we can come up with that will mechanically change shape." It's about 15 great solutions for making things grow before your eyes. AVC: Was there anything you set out to do that you just couldn't, or that you had to radically alter for the film? HS: Not really. I feel like what we love to do is solve problems. If it's easy to solve, we find a more difficult one. There's always a way. In our world, we can build stuff. We can build more sets than you could ever build in live-action. We can build more props just for custom angles or perspectives. We'll build special trees for that, paint a sky. There's really no limitations, except that you run out of time and money at some point. AVC: How do your current building and design techniques compare to the ones you used on Nightmare Before Christmas? Were there major technical differences between the two films? HS: At the heart of both films is the fact that an animator performs through a puppet that's lit on a set. So there's no difference there—it's still a very challenging, arduous process to bring these characters to life. Puppets themselves, for the most part, are built identically. We use slightly different materials for their skin—silicone instead of foam rubber. There were several key areas of technological advance. One was in the facial animation. We knew Coraline needed to be a lot more expressive than Jack Skellington, because he's really just a ping-pong ball with no eyeballs, and a mouth. And in his case, we did traditional replacement animation—it's like the Pillsbury Doughboy, where every expression is sculpted separately, and you just pop them on and off to get him to emote. With Coraline, we put a big split along her face so we have separate control of her upper faceplate and the lower faceplate, with her mouth. The materials we used—we'd start with drawings and scopes, but we did use computers to help figure out the in-between shapes so we didn't have to hand-sculpt. There's thousands of different faces for her. We would do all the key images and then a computer to figure out all the in-between shapes and literally print those out in three dimensions. She's very expressive for a stop-motion character. That technology is called Rapid Prototype, headed up by Martin Meunier—it was a huge contributor. We went places we never thought we could go because of using a 3D printer to help flush out the faces. The other big thing is, we shot the film digitally. I've never done that before. It's always been film. We shot it in 3D because it's part of the story, and there's a long history of wanting to do 3D in stop-motion. And that added a lot of challenges. But shooting digitally allowed me to see dailies almost every day. With digital, the animators can finish a shot and I can review it immediately. If it's a test, I can go check in on them out on their sets, and they can show me where they've gotten to. On Nightmare, they couldn't. It was on film, and the most we could store in the camera was two images. So this is what I liked about shooting digitally—it was far more fluid. Sort of a give-and-take on a regular basis. It felt great. AVC: You've been on record a lot about how you can't go back and watch your own work within years of completing a film, because you just see the technical flaws. Does being able to instantly review your footage after shooting it mean that you're more comfortable with the finished product? Or did it take twice as long to make the film, because you can see the flaws instantly, and you want to go back and redo every shot? HS: [Chuckles.] Yeah, the technology did not make things faster. Making things more fluid does sort of enable you to improve the shot. It was always a battle to keep the hand of the artist in there. Sometimes we'd shoot on twos vs. ones, so there's not as many images per second, and it looks a little more stuttery. In the old days, we'd just shoot straight ahead on film. You did your shot and you weren't able to look back at all, and it was much faster. But I think we have a more nuanced performance with the digital. As far as looking at the finished film and seeing flaws—there's hundreds of them, but I embrace them in a way I didn't in the past. In the past, we were trying to do stop-motion traditionally, as Ray Harryhausen, the great master, had practiced it. We were trying to do realistic effects, monsters, and creatures. After Jurassic Park came out, it was clear that stop-motion can't do better than CG. CG is going to go way beyond ultra-real effects. It's taken me a number of years to really figure out and embrace what stop-motion is, with all its warts and shortcomings. So it's not going to take me five years to enjoy Coraline again. AVC: What about live-action? On James And The Giant Peach and Monkeybone, you obviously didn't have the level of fine detail and control you've had in your purely stop-motion films. Do you want to work in live-action again? HS: I'm not meant to be in live-action. [Laughs.] I love the culture of animation. What stop-motion has in common with live-action is that it has many of the same departments. There's hair, costume, makeup in the form of paint, gaffers, electricians. So there's the same sense of real stuff, real light, things being shoved around and gotten ready. But it's not like everything happens at once, like it does in live-action. It's all subdivided into these small sets. It's where my strengths are. Live-action is just an utterly different world, and I'm not a public enough persona to be big and loud at the front of the ship. I'd rather more quietly interact with the artisan animators. AVC: That seemed to happen with The Nightmare Before Christmas. Tim Burton's name is in the title of the film, yet he didn't script it, write the songs, or direct it. Do you feel like you get proper credit for that film, at least in the industry? Do people you meet generally realize that you directed it? HS: It's annoying. The name didn't go on until a month before the film came out. It would have been fine with me if it was always going to be like that. But ultimately, you could say it was a marketing thing. He was already a brand after he'd done the first Batman, and Beetlejuice. Yeah, it can be annoying. But most people in Hollywood know I directed it, because I have a long history of connections there. AVC: If there were a Nightmare sequel, would you want to be involved with it? HS: I spoke with Disney years ago about it, and at that point, the most disappointing thing was, they said, "Oh, but it'll have to be in CG." I don't think they'd say that now. And in fact, Disney is backing Tim on a stop-motion feature of an old live-action short he did called "Frankenweenie." On a sequel, it's possible I'd be involved. Coraline comes the closest to the experience I had on Nightmare, which was total creative support. Tim was great. He went off and made two live-action films while I directed Nightmare, and he was this buffer between me and the studio, so that all the effort went into the film. Between Nightmare and Coraline, I did far more difficult work. Energies were drained dealing with politics and studios, and that sort of thing. This has been more like Nightmare. Easily 90 percent of the efforts are up on the screen. AVC: Do you think Monkeybone would have worked better if you had that kind of complete studio support? Would it have been more of a hit if it had been marketed as heavily as Coraline or Nightmare, for instance? HS: It's very hard to know with Monkeybone what the variables were. There was a regime change when I was at Fox. There's a longer version of the film. When Hollywood gets afraid of something, they just say, "Make it go faster." Usually, faster isn't better. So there's another version of the film that's about 15 minutes longer. I know that it works better. We had a different lead originally, and that probably would have had an impact—Ben Stiller was the lead, but he wanted to bring in writers, and I chose to be loyal to the writer that was on it. It actually would have been better to go with Ben and his writers. There's a lot of variables looking back, what-ifs. But who knows. I learned my lesson that in the live-action world, you have to earn the support of people over a very, very long time. And in animation, I already have the support. AVC: You mentioned that you've done just about every type of animation there is. You also worked in cel animation at Disney, on The Fox And The Hound. Did you work on any other projects there? HS: Mainly Fox And The Hound. When I started, I did some in-betweens for this forgotten hybrid called Pete's Dragon. I was at Disney for about four years, so I made good friends there. It was a time of not a lot of creativity. It was the end of the first great era, with a few of the original animators. They called them the Nine Old Men. I learned a lot from them, but it wasn't going to be a future home for me. AVC: While Fox And The Hound was being made, Don Bluth and a bunch of other animators walked away from Disney to start their own studio, and the last of the Nine Old Men either died or retired. What was it like being at Disney as that was happening? HS: Well, it was kind of depressing. [Laughs.] I was friends with Tim Burton—he was doing exciting things. I'd like to think I was doing exciting things. I got a grant from The National Endowment For The Arts. I was making my own independent short animated film called "Seepage," and Disney was totally cool. They let me work on that a couple of days a week and work at Disney a few days a week. Brad Bird and John Musker were there—a lot of artists and directors that have gone on to do great things were there. I met them at CalArts, and then we were at Disney. So we had a lot to complain about, but we'd complain together. We'd go to galleries and go listen to the Talking Heads when they were in town. It was a lot of fun in terms of camaraderie and the creativity that I saw in individuals. But as far as the company itself, it was in a transition and there was no great creative leadership at that point. AVC: Do you have any lingering affection for the process of drawing cel animation? Any interest in doing it yourself again at some point? HS: It was always a struggle for me. Some animators, they grew up doing that. I love that process. I could see myself directing a 2D movie and really enjoying it. But going back into animating, I couldn't pull that off. AVC: Is there any plan to do a DVD collection or a release of your short material, like "Slow Bob In The Lower Dimensions"? HS: No one's talked about it. I have a few other shorts as well: "Phases," a Fishbone video, "Tube Tales." Yeah, I'd like to do that. [Laughs.] I'll figure it out. Thanks for bringing it up. HS: Immediately, I'm supporting an up-and-coming director. It's the time in my life that I want to share what I know and pass it along. So I'm supporting a young guy called Chris Butler, who was my head storyboard artist. He has an original story called Paranorman, and it would be done in stop-motion animation. It's a sweet comedy about a boy who communes with the dead. There's an army of zombies at the end. [Laughs.] But it's very funny.